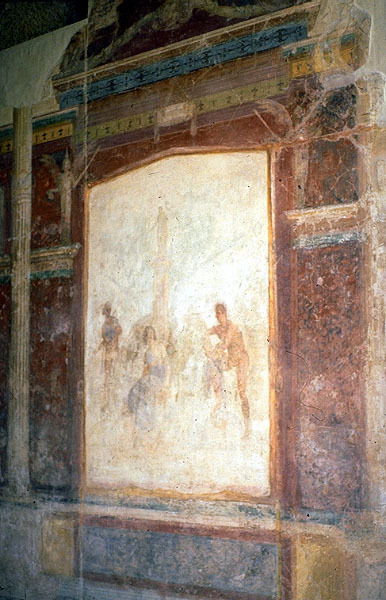 Phase IIb: about 25-15 B.C.-> the return to the so called flat wall painting has been completed now; in the center of a wall painting, there is a big painted scene and the rest of the decoration is a slight reminiscence to architecture. There is no perspective (cf. Casa di Livia, Palatine, Rome; Aula Isiaca, Palatine, Rome; Villa della Farnesina, Rome (Tiber); Casa di Obellio Firmo, Pompeii).